Top 7 Learning Apps For Students. Educational Apps. HomeLearning Apps For StudentsTop 7 Learning Apps For Students. Educational Apps. Do you have to face so many problems while doing your homework then then don't worry today I am going to tell you Top 7 Learning Apps For Students. So hello friends my is Varun Sharma and today I am going to tell you Top 7 Learning Apps For Students. 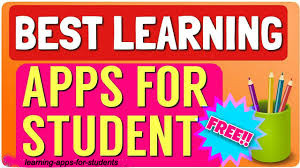 friends those apps I am going to tell you will really help you in your studies.These apps are especially for 8th class and for higher class. These app make you perfect in studies. With the help of your smartphone you will really become smart in your studies. Using these apps you can score good marks.We can say that these are the digital educational system.You can make your phone a learning tools.So here are the Top 7 Learning Apps For Students. So lets start and know the features of our cool apps. Note:- Friends I am not promoting any app I am just advising you because I have personally used these apps because I am also a student. Friends Khan Academy is an super cool app if you have any problem in any subject you can join Khan Academy for free, you can clear you droughts by giving extra time.It is one of the best learning app.This app is specially known for maths,science,and economics,etc. It provides you free videos with better explanation.If you area serious student/ parent the you should download this app. It is a good app you can join with this app for free.You can clear your all the doubt there any one can join this.It provides you best study material for classes 6th to 12th.You can share your problems with others by making your profile, and you can share your answer with other students.Special thing in this app is you can share your knowledge with others and other cool thing is you will get homework like classes.In this way you can learn in better way.It also provides you video material to clear your topics.I think this app is beneficial for all the students and you should download it. You have header about this website too much this is one the most popular website and app on the google.You waste your time on whatsapp , facebook or other social medial website you can spend your time by learning something new.Wikipedia is a source of knowledge it provides you unlimited knowledge.If you need detailed information about anything then you should download this app.You can also use it for writing essay and when you will praised for your essay then you will surely say thank-you to this app.You should download it now😉😉. Some of my friends think that maths is ghost. They fear maths too much then we have a solution for them by using this app you will think that maths is a very easy subject. Photomath application solve your questions in minutes. To multiply some big digits you have to type in calculator,but in photomath you have to just keep you question in front of the camera and this app will solve your question automatically.This application make your smart phone really smart.It will save your precious time.You should download this application. It can be better app for you if you want to share any document or notes with your friends. In simple way you share your document with your friends by clicking a photo.But this application work as a scanner. It scan a document in good quality.You can also trim the image.This app can be better for students.You need this app in classroom, then I think you should download this app. When teacher tell you to note something in class then first you have to open your notebook,but using this app you can note down or you can create your documents.If I am siting in a park a have remember a very important thing then I will open this app ad I will write down my note click on save that's it. Quora is also a famous website like wikipedia you can gain knowledge of anything in detail with quora. You can ask you question to whole world by making your profile on quora and you can give anyone's question's answer. Quora will provide you very interesting answers. It will clear your all the doubts. It is an very integrating application. I think you must download this application. So friends I hope you will like our post "Top 7 Learning Apps For Students" Friends these apps are really make you intelligent once you should try them. If you like our post then please share it and if you have any type of question please comment we feel happy to help you & remember sharing is the caring.